Lapland, the 1930s. Irga, the pregnant daughter of a former White general, escapes her pursuers on skis and crosses into Soviet Russia. Waiting on the other side is the agitator Suenhammas and a new life. Irga’s path takes her far north and east to the camps of the Vorkuta Gulag, and down to the Volga Bend and Kazan, and to the Mari Autonomous Oblast. When she finally settles in the tiny Mari village of Lavra, Irga carries a secret that she must protect more fiercely than her own life. Russia, 2015. Laid out in a village schoolroom is the body of the ethnologist Henrik. His Finnish daughter Verna has come to look for her long-lost father, but she arrives too late. Verna finds herself trying to piece together his and her past in an environment where people have been frightened into silence and everyone has their own reason to withhold the truth. The Maris are a Finno-Ugric ethnic group, historically related to the Finns, and the Mari society – with its ancient myths and sacred groves – is struggling to preserve the national language and culture against pressure from without. The fates of the characters in the novel crisscross one another, and the two historical periods are deliciously interwoven and compared; the author has forged a great narrative of language, love, and power. Again, Katja Kettu’s prose flows effortlessly and delightfully between past and present, spanning the bare landscapes of northern Europe and the fringes of central Asia. The beautiful and the ugly, the sordid and the sublime take turns at the helm in Kettu’s writing. Her idiosyncratic way with language draws on the tradition of Northern grotesque with a dash of magic realism thrown in. Hawk Moth is a universal tale of sisu and survival. Hawk Moth has sold close to 40 000 units in Finland alone. 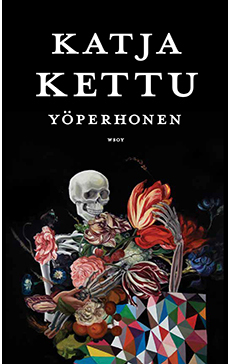 An extract of Hawk Moth has been published in Swedish in Granta #5 and in English in the special edition of Granta #3 (Finland). (…) This straightforward literary commentary on the current political situation is smart and decadently grotesque, and thus it evokes the work of Vladimir Sorokin. (…) A moth becomes, in this world of sacrifices and offerings to demons, a symbol of the human soul, which can free itself from the shackles of the body.